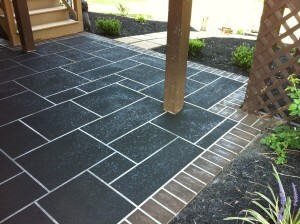 Our customers often struggle with choosing a design for a concrete overlay on larger patios or driveways. They don’t want to have a solid colored overlay because they are worried it will be too plain, and they worry about choosing a pattern because they don’t want it to look too busy on such a large area. We have found that our custom hand-taped large slate pattern works well on large areas. Here are a few photos of a large slate concrete overlay on a patio in Lynchburg, VA.
We started this job by cleaning the concrete. Then we used 1/2″ wide tape to create a large random slate pattern across the entire patio and a brick header course around the border. After the pattern was applied, we sprayed a dark brown concrete mix on top of the tape. Then we removed the tape and sealed the entire patio. How far do you travel to do a job? I live in Concord, NC, just north of Charlotte. We do some projects in your area. Send us more info through the contact page on our site and we can discuss it further. Thanks!